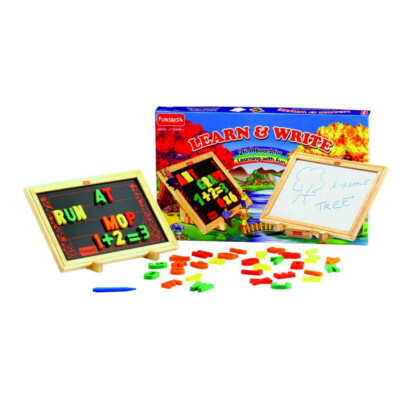 Introduce basic language and mathematical concepts to your children in an interesting way with the Funskool Learn and Write 2 in 1 Magnetic Writing Board. Featuring a double-side flappable board, it allows you to teach your child to write on one side or learn by placing magnetic pieces on the other. It comprises 46 magnetic pieces including 26 alphabets, 5 vowels, 10 numeric digits and 5 mathematical signs. This magnetic writing board for kids helps in making your child understand and learn word spellings and simple mathematical concepts. The Funskool multicolour magnetic writing board is a cool way to mix learning with fun. Its other side is a dry-erase white board, which your kid can use to practise writing. This double sided magnetic writing board includes a duster and a sketch pen, which your little one can use to practise spellings and sums. Your children and their friends will also enjoy drawing pictures on it. Moreover, this learns and writes magnetic board can be a nice way for your kids to spend their leisure time productively.